You may have spotted that this week is Mobile Technologies Week! We are halfway through Mobile Technologies week and today, Ant Groves, Learning and Teaching Librarian from the Library, talks about the wonderful ‘MakerClub’. The second day of Sussex Mobile/Technologies Week began with an inspiring set of talks from last year’s TEL Innovation Scheme winners, where the importance of tinkering and taking a playful approach to learning was mentioned on several occasions. The afternoon workshop from Brighton’s own MakerClub (who run workshops throughout the year in their MakerLab on London Road) gave us the opportunity to do just this, turning the Library Open Learning Space into a temporary pop-up makerspace where we were introduced to robotics, coding, 3D printing and ‘the internet of things’ through a mixture of hands-on activities and demonstrations. ‘a makerspace is an area where people can come together to create things, experiment and learn together’ (2013, para.2). The New Media Consortium report argues that these spaces “further position libraries as gateways to new skills, in addition to new knowledge” (2015, p.1). The report also recognises that “widespread support behind makerspaces in education is growing as an abundance of student-led examples of research and innovation are surfacing on the global radar” (2015, p.36), as demonstrated by the DIY Digital Microscope discussed in the morning’s Innovation Scheme presentations. There certainly appeared to be widespread support for the Library Makerspace. The session was fully booked and participants came from all areas of the academic community providing a rare opportunity for students, academics, researchers and support staff to work together on a practical task. The workshop began by introducing participants to robotics, in particular some of the hardware we would be using throughout the session: laptops, servos and Arduino microcontrollers. Essentially we used the laptop to program the Arduino that would control the servo that made the robot move. 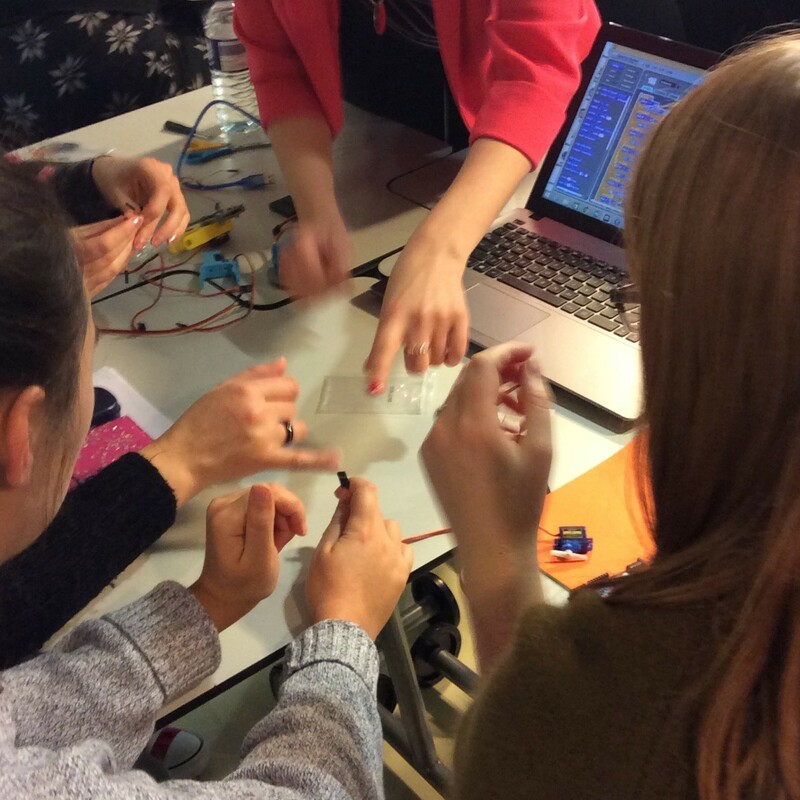 MakerClub explained how these microcontrollers can be programmed and placed in different types of machines to perform different functions; this reduces the need for specific pieces of hardware as software can be used to repurpose these microcontrollers for different appliances. The activities increased in complexity throughout the workshop with new components such as breadboards being introduced. This allowed teams to use devices controlled by numerous servos, in this instance a pre-printed robot arm with three joints. 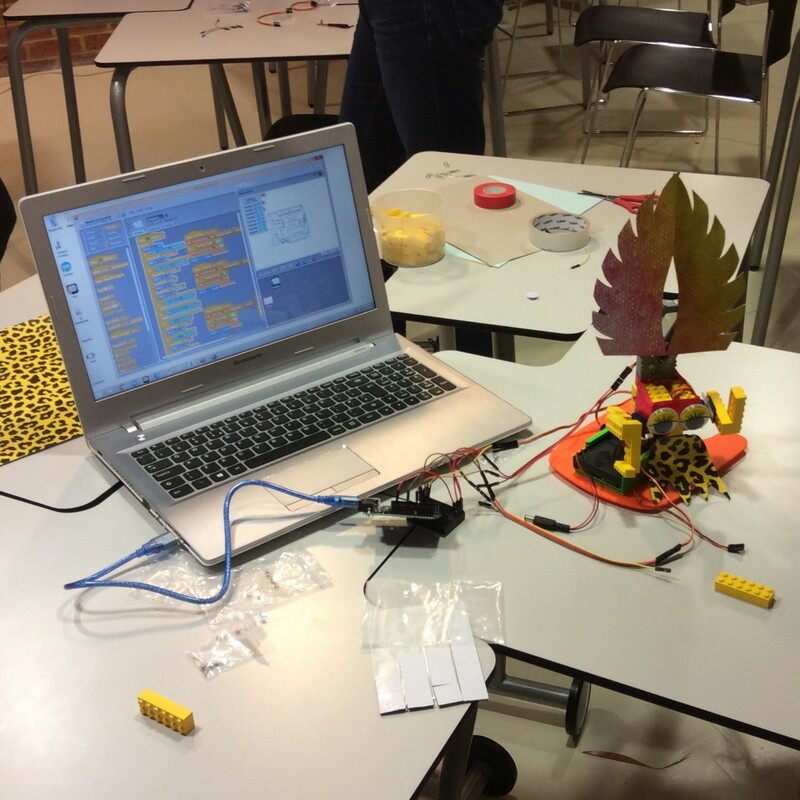 The activities were interspersed with short presentations on related subjects such as 3D printing and the internet of things, which gave our creations some context and allowed us to consider the wider applications of this type of physical computing. With the price of 3D printing dropping and the increasing availability of cheap Wi-Fi enabled microcontrollers it is likely that these technologies will continue to have a growing impact on student research and innovation. Jones, D. (2013) ‘Information Centre or Makerspace’, Information spaces, 25 July. Available at: https://informationspaces.wordpress.com/2013/07/25/information-centre-or-makerspace/ (Accessed: 23 November 2015). The New Media Consortium (2015) NMC Horizon Report: 2015 Library Edition. Available at: http://cdn.nmc.org/media/2015-nmc-horizon-report-library-EN.pdf (Accessed: 16 July 2015). 1 Pings/Trackbacks for "MakerSpace in Mobile Technologies Week"